Once you’ve rented a Boston luxury apartment the next step is to decorate it in a way that enhances your style and showcases your unique personality. Here are our top five home decor trends — mix and match them for a look that is totally your own. 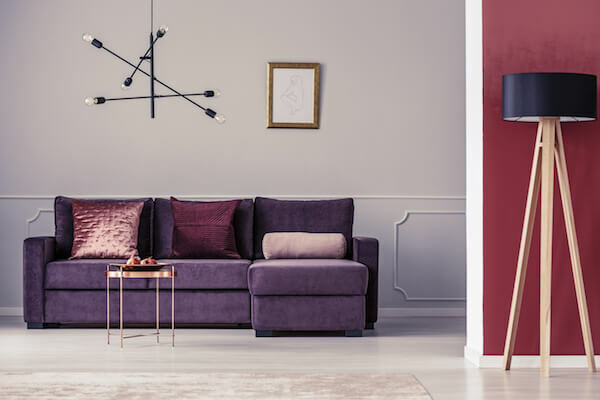 The traditional three-cushion sofa has lost traction in the home furnishings industry because more people are entertaining in their space. They need a place for people to sit comfortably and have conversations, and small couches are not it. Sectionals certainly solve the seating problem, however, they’re typically more functional than stylish. Enter the curved sofa — a trending new option for luxury apartment renters who want the best of both worlds. A curved sofa underneath a picture window overlooking the Boston city skyline is the perfect place to entertain or simply relax with a book and a cup of coffee. Selecting art to decorate a Boston luxury apartment can be challenging. You want to strike a balance between adding the right amount of color and style without detracting from the natural beauty of the space and its architecture. Geometric art has a clean, modern feel that fits well with most luxury apartment layouts and can give the apartment a fresh look without going over the top. Geometric art also blends well with other styles. Showcase culture in your new home by adding furniture and accessories that reflect a certain geographical area or time period. Borrow ideas from 18th century France, or showcase the rich history of Boston itself. Choose eclectic pieces that emphasize Boston’s shipbuilding history, or honor Salem’s past by incorporating a magical, new age feel. There’s nothing off limits and you can mix and match pieces from many different styles and cultures to create a melting pot within your own home. Want to pair an antique Persian rug with a carved lamp from South Africa? Go for it. In the past, luxury meant more. Gilded drapes and plush carpeting were outshone only by decadent crystal decanters and a baby grand piano. Now, luxury means less is more. Renters of Boston luxury apartments are being more selective with their decor choices and showcasing a few really stunning pieces. Instead of collecting treasure, so to speak, apartment renters are collecting memories. Pieces on display have meaning and stories behind them, and there are enough to fill the space without taking the focus away from the core design elements. When decorating your Boston luxury apartment, choose furniture and accessories that have meaning to you and go for a more minimalist feel. Coloring a luxury space can seem difficult at first. Do you go bright and bold for a look that turns heads? Or do you stick to more subdued colors that work for every season? Today’s interior designers are actually doing a little bit of both. Luxury apartments are being decked out in largely neutral colors like grey, white, and ecru and bold pops of color are added in. For example, a neutral dining room could have a bright turquoise table or a living room could have a bold, colorful rug and throw pillows on the sofa. What’s great about starting with a neutral base is that you can change up your decor much more easily when the mood strikes. Looking to rent a Boston luxury apartment? Boston Pads can help you find the rental space you want in the location of your dreams. Contact us today to learn more!